1. Prepare the mahi by first washing and drying it well. Remove the blood strip, then slice into 1/2" x 1 1/2" strips. Set aside. Place the oil and butter in a Teflon pan and melt over medium heat. When the butter has melted, Add the chopped vegetables, and blacken. Cook over medium heat for about 7 minutes. Add the Mahi and continue to cook until the Mahi has lost it's pink color. Set this in a bowl, while you prepare the Enchiladas. Place the pan back on the stove without wiping it clean. 2. Add about 3/4 cup of enchilada sauce to the warm pan. Dip a tortilla into the sauce, flip it and coat the other side. Place this on a rimmed platter, add some of the Mahi / Vegetable mixture, and roll it. 3. Place this in a 9" x 9" baking pan. 4. Pour the leftover enchilada sauce from the pan, plus additional to cover the enchiladas. 5. Spread the grated (or sliced) cheese on top. 6. Bake in a 350 degree oven for about 15 minutes, or, until the cheese has melted. 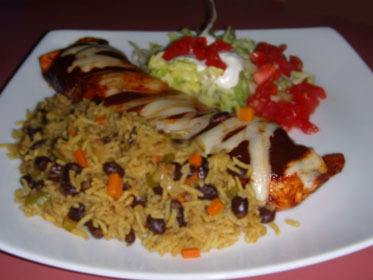 Serve with South West Rice with Beans, Shredded Lettuce, Chopped Fresh Tomatoes, and Lime Sour Cream. Of course you should also keep plenty of Sam Adams on hand to handle the heat.